February 2019: Pavithraa Seenivasan presented her research from the lab at the Computational and Systems Neuroscience Conference (COSYNE 2019) held at Lisbon, Portugal. February 2019: Rishi presented research work from the lab as part of the Indo-French scientific and training workshop organized by and held at Université Côte d'Azur, Nice, France. 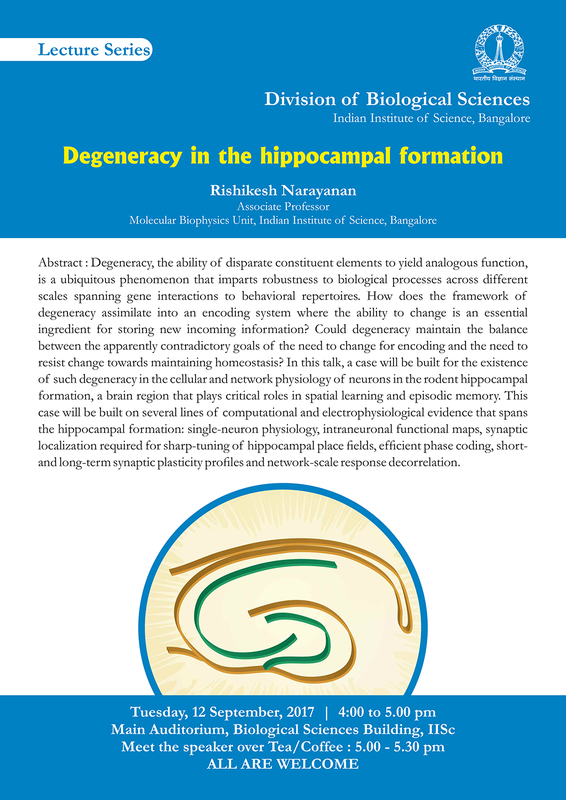 December 2018: Rishi presented research work from the lab as part of the Revati and Satya Nadham Atluri Chair Award Lecture at IISc. September 2018: Poonam Mishra presented her research from the lab at the 17th Annual Molecular and Cellular Cognition Society meeting in San Diego, CA, USA and in the Society for Neuroscience Annual Meeting, San Diego, CA, USA. September 2018: Poonam Mishra and her team members (part of the Neural Systems and Behavior course organized by the Marnine Biological Laboratory, USA) published their study on the rat oral somatosensory cortex. August 2018: Rituparna Roy joined the laboratory as a PhD student. July 2018: Divyansh Mittal attended the QBio summer research course on Neurophysics of Sensory Navigation at the Kavli Institute for Theoretical Physics, University of California, Santa Barbara, USA. July 2018: Arunima Banerjee joined the laboratory as a research trainee. July 2018: Rishi presented research work from the lab in the IISc-UCL symposium on neuroscience, machine learning and artificial intelligence, held at the Gatsby Computational Neuroscience Unit, University College of London, UK. June 2018: Manisha Sinha presented her research work at the EMBO Workshop on "Dendrites 2018: Dendritic anatomy, molecules and function" held during 17–20 June 2018 in Heraklion, Greece. June 2018: Reshma Basak attended the Neural Systems and Behavior course at the Marine Biological Laboratory, Woods Hole, USA. June 2018: Pavithraa Seenivasan attended the Transylvanian Experimental Neuroscience Summer School (TENSS) at The Pike Lake, Transylvania, Romania. April 2018: Manisha Sinha moved to Dr. Jean Christophe Poncer's laboratory in IFM - Institut du Fer à Moulin, Paris, as a postdoctoral fellow. February 2018: Anindita Das moved to Dr. Jesse Goldberg's laboratory in Cornell University, USA, as a Postdoctoral fellow. December 2017: Anindita Das successfully defended her PhD thesis. November 2017: Manisha Sinha presented her research work at the Society for Neuroscience Annual Meeting, Washington, D.C., USA. September 2017: Rishi presented research work from the lab as part of the lecture series organized by the Division of biological sciences, IISc. July 2017: Anindita Das submitted her PhD thesis. July 2017: Subhash Chandran joined the laboratory as a research trainee. July 2017: Manisha Sinha received her PhD degree from the Institute. April 2017: Abha Jain completed degree requirements for her B.S. degree and joined the lab as a Masters student. March 2017: Anindita Das presented her research work at the Gordon Research Conference on Dendrites: Molecules, Structure & Function held at Lucca (Barga), Italy. January 2017: Reshma Basak attended the IBRO-SIMONS Computational Neuroscience Imbizo held at Cape Town, South Africa. December 2016: Rishi presented research work from the lab in the joint Israel-India Neuroscience symposium held at Eilat, Israel. December 2016: Lab selected for receiving Senior fellowship from the Wellcome Trust-DBT India Alliance. November 2016: Manisha Sinha successfully defended her PhD thesis. November 2016: Sufyan Ashhad and Poonam Mishra presented their respective research work from the lab at the Society for Neuroscience Annual Meeting, San Diego, CA, USA. September 2016: Rishi was awarded the Shanti Swarup Bhatnagar Prize in Biological Sciences. August 2016: Neha Soman joined the lab as a research trainee. August 2016: Manisha Sinha submitted her PhD thesis. August 2016: Chinmayee Mukunda moved to the National Centre for Biological Sciences, Bangalore, as a PhD student. July 2016: Sufyan Ashhad moved to Prof. Jack Feldman's laboratory in the University of Califonia at Los Angeles, USA, as a Postdoctoral fellow. June 2016: Rishi presented research work from the lab in the EMBO Workshop on Dendritic Anatomy, Molecules and Function held at the Foundation for Research and Technology - Hellas (FORTH), Heraklion, Greece. June 2016: Poonam Mishra attended the Neural Systems and Behavior course at the Marine Biological Laboratory, Woods Hole, USA. 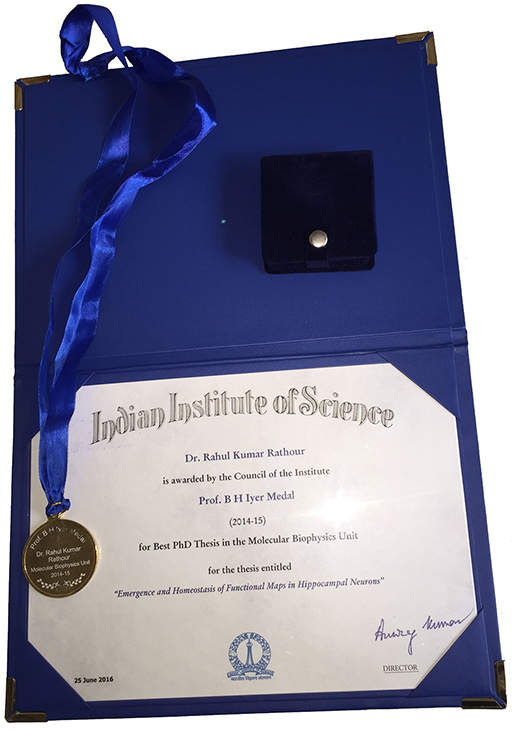 June 2016: Rahul Rathour received the Prof BH Iyer medal (2014-2015) for the best PhD thesis in the Molecular Biophysics Unit, IISc. May 2016: Sufyan Ashhad successfully defended his PhD thesis. May 2016: Divyansh Mittal joined the lab as an integrated PhD student. February 2016: Rahul Rathour moved to Prof. Daniel Johnston's laboratory in the University of Texas at Austin, USA, as a Postdoctoral fellow. January 2016: Abha Jain joined the lab to do her BS final year project. December 2015: Sufyan Ashhad submitted his PhD thesis. December 2015: Manisha Sinha was awarded the Shell India Computational Talent Prize (Silver Award). October 2015: Sunandha Srikanth presented her research from the lab at the Society for Neuroscience Annual Meeting, Chicago, IL, USA. October 2015: Manisha Sinha presented her research from the lab at the 14th Annual Molecular and Cellular Cognition Society meeting in Chicago, IL, USA. August 2015: Sunandha Srikanth moved to the University of California, San Diego, USA, as a PhD student. August 2015: Anindita Das was awarded the Bristol Myers Squibb	fellowship. August 2015: Pavithraa Seenivasan joined the lab as a PhD student. July 2015: Rahul Rathour and Sunandha Srikanth respectively received their PhD and BS degrees from the Institute. March 2015: Chinmayee Mukunda joined the lab as a research trainee. February 2015: Rahul Rathour successfully defended his PhD thesis. November 2014: Sufyan Ashhad and Rahul Rathour presented their respective research work at the Society for Neuroscience Annual Meeting, Washington DC, USA. August 2014: Manisha Sinha attended the Methods in Computational Neuroscience course at the Marine Biological Laboratory, Woods Hole, USA. August 2014: Reshma Basak joined the lab as a PhD student. July 2014: Rahul Rathour submitted his PhD thesis. June 2014: Rahul Rathour attended the OIST Computational Neuroscience Course at the Okinawa Institute of Science and Technology, Okinawa, Japan. June 2014: Manisha Sinha attended the Neural Systems and Behavior course at the Marine Biological Laboratory, Woods Hole, USA. 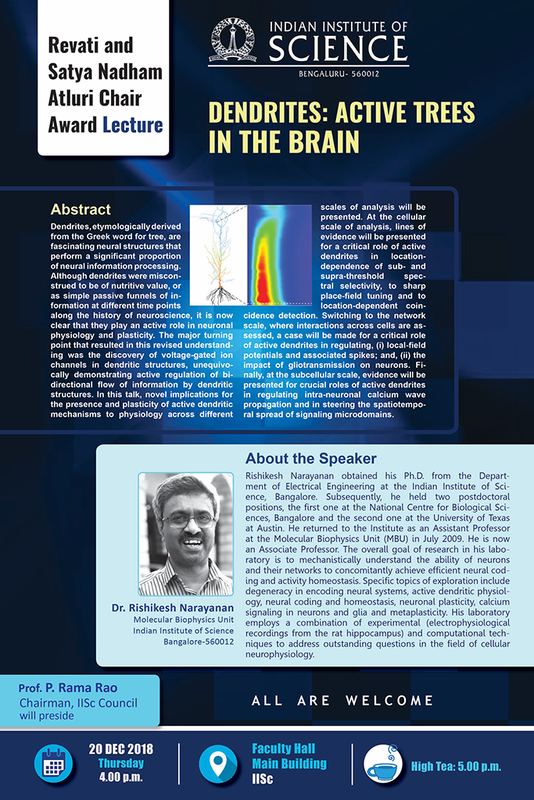 March 2014: Rishi presented research work from the lab in the symoposium on Neurophysics of Space, Time and Learning held at the Kavli Institute of Theoretical Physics, University of California, Santa Barbara, CA, USA. January 2014: Sunandha Srikanth joined the lab to do her BS final year project. July 2013: Reshma Basak joined the lab as a research trainee. June 2013: Sufyan Ashhad attended the Neural Systems and Behavior course at the Marine Biological Laboratory, Woods Hole, USA. August 2013: Poonam Mishra joined the lab as a PhD student. 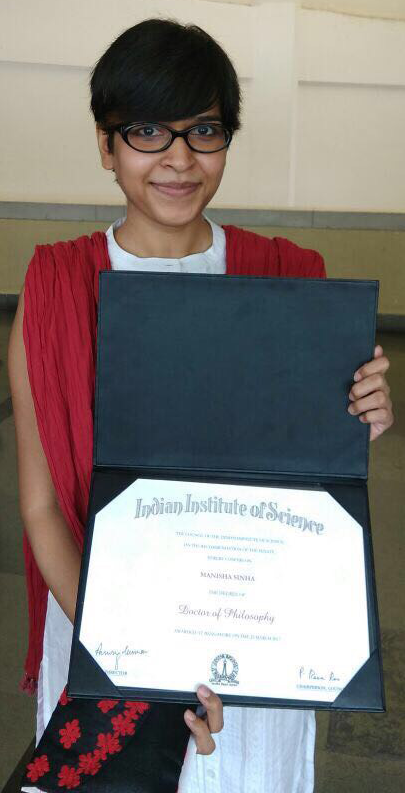 June 2013: Manisha Sinha was awarded the Microsoft Research India 2013 PhD Fellowship. May 2013: Anindita Das and Manisha Sinha presented their respective research work at the Gordon Research Conference on Dendrites: Molecules, Structure & Function, held at Les Diablerets, Switzerland. May 2013: Lab received a grant from the Cognitive Science Reseach Initiative of the DST. May 2013: Neha Dhupia joined the lab to do her final year MTech project. February 2013: Poonam Mishra joined the lab as a research trainee. October 2012: Sufyan Ashhad presented his work at the Society for Neuroscience Annual Meeting, New Orleans, LA, USA. August 2012: Suraj Honnuraiah moved to ETHZ, Zurich, Switzerland, as a Master's student. July 2012: Rahul Rathour attended the Computational and Cognitive Neuroscience Summer School conducted by Cold Spring Harbor Asia at Beijing, China. August 2011: Manisha Sinha joined the lab as a PhD student. May 2011: Anindita Das joined the lab as an integrated PhD student. January 2011: Suraj Honnuraiah joined the lab as a research trainee. May 2010: Sufyan Ashhad joined the lab as an integrated PhD student. January 2010: Career	development award from HFSP activated. August 2009: Lab established! Rahul Rathour joined the lab as a PhD student.